About 34,000 commended Students throughout the nation are being recognized for their exceptional academic promise. Commended Students placed among the top 5% of more than 1.6 million students who entered the 2019 competition by taking the 2018 Preliminary SAT/National Merit Scholarship Qualifying Test (PSAT/NMSQT). Noah, being named Commended Student has demonstrated outstanding potential for academic success. He represents a valuable resource; recognized for his accomplishments, as well as the key role Mineral Wells High School plays in expanding his academic development. Noah is vital to the advancement of educational excellence in our nation. The program hopes that this recognition for Noah will help broaden his educational opportunities and encourage him as he continues his pursuit of academic success. Noah joins the ranks of MWHS students like Hannah Gilbreath (Class of 2015), Don Turner (2016), Jacob Walsh (2017), and Kate Gilbreath (2018). Noah has been accepted at the University of Texas and plans to major in Computer Science. 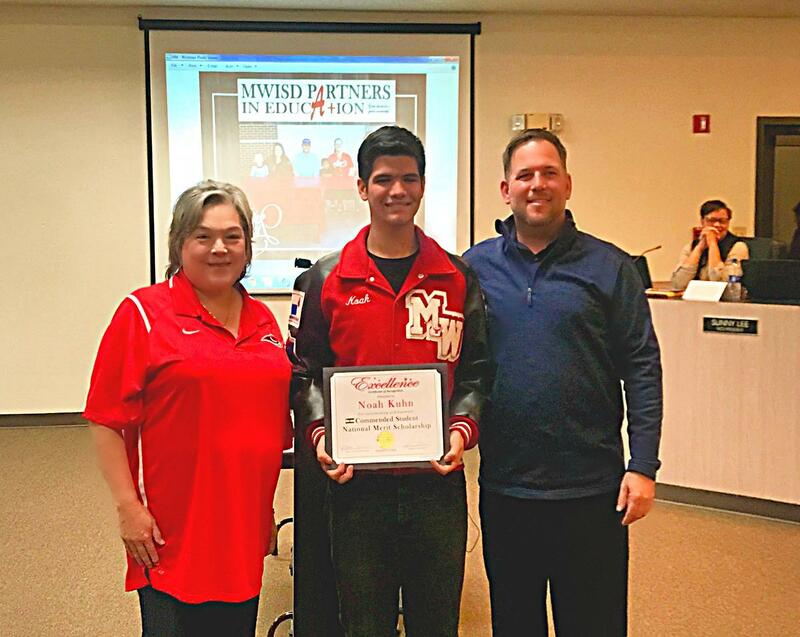 The Mineral Wells ISD Board of Trustees honored the academically talented MWHS senior, Noah Kuhn for his astounding achievement of becoming a National Merit Commended Student.